Like listening to a Dutch band trying to imitate the White Album. The lyrics are Haiku-crisp and impressionistic. The stuff breathes. This is the multi-instrumentalist duo's third album, titled, simply, Third. As with their previous releases, Third has that two-guys-in-a-home-studio-who-have-listened-to-too-much-music sound, but only in the best way. (Jim Price was a longtime WFMU DJ and played drums for legendary home-taping giant R. Stevie Moore.) Like any good post-post-post band (think Ween, Oneida) they romp in a garden of styles without ever getting academic about it. I sometimes get the feeling I'm listening to a Dutch band trying to imitate the White Album. Wonderful! The familiar made strange. Certainly some sublime music has been made by home-noodlers: Emmit Rhodes comes to mind. Neblung Price aren't pop monsters like Rhodes, but they're something just as unusual: poets. Yep. I only started getting the beautiful unity of this album after a number of listens (usually a good sign; there aren't many masterpieces that reveal themselves quickly and dirtily). Now, don't go getting yer gauge up; I'm not claiming Forever Changes status for this monkey; the jury's still out. But I will tell you this. Third is held together by a kind of dark (yet smart-assedly playful) sensibility not altogether dissimilar from its Big Star namesake. Fear and doubt seem to be the predominant emotions here, carried as much by the music as by the words. Or rather by some ineffable sum of music and words. Most of these songs begin with lovely acoustic-guitar fragments that keep on cycling, often drenched in long reverb and reminiscent of classic Brit-folk. A second, distorted guitar might enter, plus a simple Satie-like piano figure. The occasional drum (usually not a full kit) or percussion egg. There's not a lot of dramatic "development"; more often a long A section, followed by a brief B section, then back to an A coda. The words tend to be Haiku-crisp and somewhat impressionistic, the delivery affectless. Phrases sometimes repeat at random, in the manner of Gertrude Stein. In general, the stuff breathes. The opening cut, featuring some character named "Marigold" (I have no idea) actually succeeds in being...well, eerie. The third song reprises some of the same lyrics in a different setting. Wild stuff this is. In a quiet way. 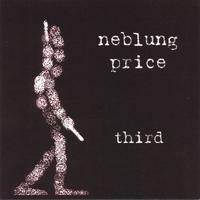 Of course, just when ya think ya got 'em pinned down, Neblung Price squirms away: "The Boldface Three" comes out of left field like a blast of Rubber Soul country-folk-rock, but somehow fits like a puzzle piece into the whole; as does the hilarious "Thank You Bags," narrated by a young indie geek (who sounds like Wayne Coyne) enthusing about his fave obscure band ("I might be their only fan"). As does "Mandrake Hose," an unabashedly pretty forty-six-second acoustic-guitar duo. The final number, "Dark by Seven," brilliantly combines the strains of whimsy and foreboding, as an addled narrator indulges in paranoid musings: "looking at a cobweb/chewing on my thumb...the phone might ring/and that could change everything...it's getting dark by seven/I'm so afraid." Not sure who this fellow is but he sounds like a latter-day Syd Barrett as played by David Thomas. The piece disintegrates into coughing and applause, and an acoustic guitar comes from out of nowhere to pick up the baton and carry it to the finish line. 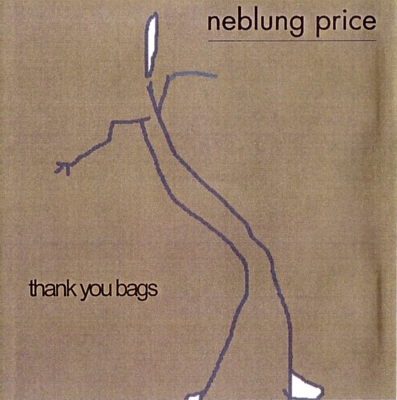 Bravo, Neblung Price. Bravo, Garden State. this music feels great. it is immediately accessible to most ears. it is made by people with good hearts and spirits. i listen to it again and again. the cost is way more than reasonable. buy it. it is tasty.